The Seattle Seahawks might be the toast of the NFL this season, but they’re still playing in a division — and conference — that’s long been ruled by their NFC West rival, the San Francisco 49ers. Fans of the Seahawks and 49ers have been going back and forth at each other this season, with Seattle fans going so far as to send a plane trailing a pro-Seahawks banner over Candlestick Park recently. San Francisco fans are moving to retaliate, and, like any good fans of a franchise with a storied history, they’re pulling the Super Bowl card. 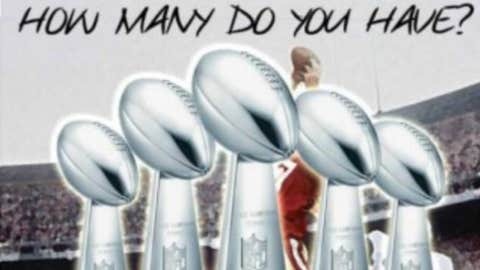 49ers fans have raised more than $8,000 to put up a billboard near Seattle’s CenturyLink Field that shows the team’s five Lombardi trophies overtop a photo of "The Catch" (when Dwight Clark pulled in the game-winner against the Cowboys in the 1982 NFC championship game). Across the top of the image is the wording, "How many do you have?" Project organizers thought $7,000 would be enough to get the billboard, and — in a move not bound by the rivalry — they say extra donations will go to Children’s Hospital in Seattle, according to Comcast SportsNet. "We’re going to try to keep it classy and represent the 49ers," said Aasheesh Shravah, who started the effort.